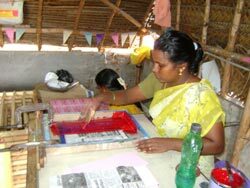 Auromira is a Fair Trade organisation based in Pondichery, South India. The principle goal of Auromira Exports is to improve the lives of the less privileged rural youth of the surrounding Villages of Pondicherry by helping them to create beautiful, simple and useful handicrafts in order to become self reliant artisans fully integrated in their communities. Auromira is a small organisation currently working with 5 producer groups. The organisation is not receiving any funds for its social activities. With their limited margin they can give to their producer groups 14 days holiday per year with salaries, free medical expenses, long term loans and short term advances. Auromira provides Shared Earth with a wide range of incense.